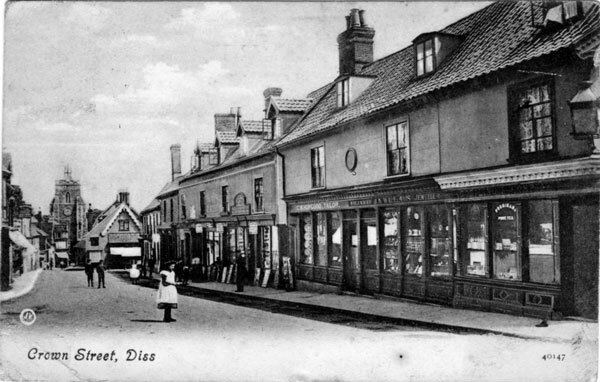 One of John's ancestors, Harriet Alice Leeder was born in 1829 in the market town of Diss in Norfolk, England. The top left photograph shows a view along Mere Street with a F.W. Woolworth & Co Ltd (now Carpetright) store at numbers 55-56 on the left hand side. 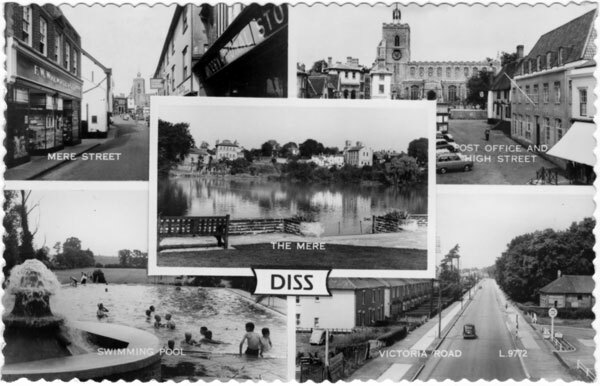 The top right hand photograph Post Office and High Street shows the post office building on the right. 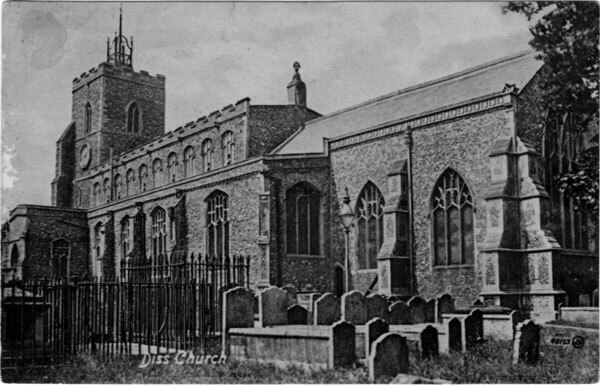 St Mary's Church Clock Tower is visible in the background. The bottom right shows Victoria Road. The photograph may have been taken in the vicinity of the Shell Petrol Station. 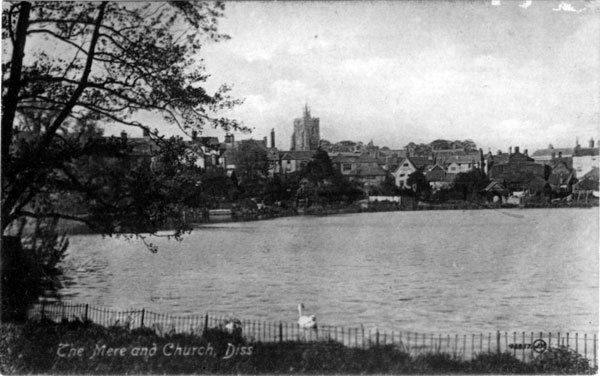 The centre photograph is of The Mere sometimes known as Diss Mere. It is a circular lake of about two and a quarter hectares. Crown Street is now Saint Nicholas Street and the St Mary's Church Clock Tower is visible at the end of the street. One of the shops on the right is C.W. Hopgood, Tailor. The Hopgoods had a tailor's shop there from 1902 until 2007. The postcard was sent to Mr E A. Kemp (? ), Newsagents, 276 High Road, Wood Green, London N.
Valentine's Series Postcard sent to Mrs R Norris, 231 Brecknock Rd, Tufnell Park, London N.
The 14th-century parish church of St. Mary the Virgin is in the centre of the town. Note the large buttresses. Valentine's Series Postcard posted to Miss Annie Baldry, 46 Burlington Rd, Ipswich [Suffolk] 19 June 1909. 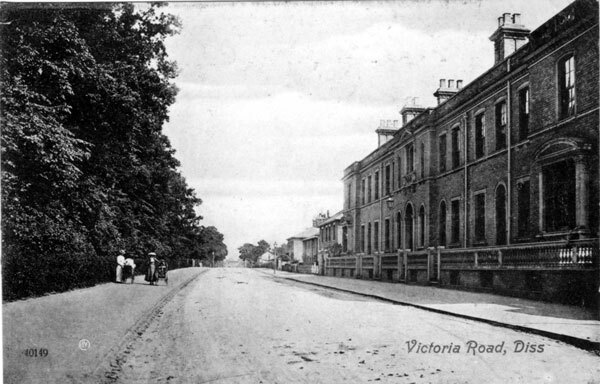 This photograph seems to have been taken in the vicinity of the roundabout to Tesco in Victoria Road near the Whytehead Gardens intersection. Wigg, Celia (2007) 'End of an era for the tailor of Diss' in EDP24 24 March 2007. Accessed 22 Janaury 2015.